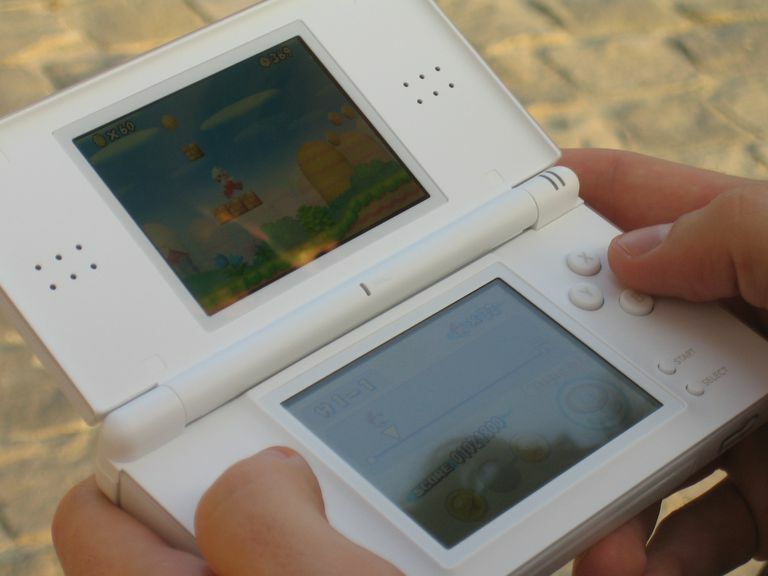 Check out these cheat codes and secrets for the "New Super Mario Bros." video game for the Nintendo DS​ ​handheld video game console. Released in 2006 by Nintendo, it is the best-selling game for the DS and one of the best-selling video games of all time. To play as Luigi in single-player mode, hold L + R and press A when selecting a saved game file. When it loads, you control Luigi instead of Mario. In World 2-4, just past the two Piranha Plants after the mid-level point, you come to a staircase with a turtle coming down it. Jump on the turtle just as it is about to go off the third stair from the bottom. If you do it correctly, Mario continues to jump on the turtle and earn up to 99 lives. If you miss the turtle, go back toward the left, return to the staircase, and the turtle will respawn. This is a reference to the original "Super Mario Bros." game, in which you could do the same trick to get unlimited lives. Collect 100 gold coins to earn an extra life for Mario. Additionally, at the end of a stage, jump up and land on top of the flagpole to earn an extra life. Successfully complete the game to add a star icon next to your save file. Successfully complete all World maps by finishing all stages and locating all secret exits to add another star icon next to your save file. Spend all Star Coins to add another star icon next to your save file. Successfully complete the game to earn the option to save your game anywhere. When you start a new game, the Save option is available under your menu in the map screen. Successfully complete all stages, including the lettered bonus stages, then load the saved game file, and Toad Houses no longer disappear after you take the items. The only exceptions are the ones that appear based on your timer when you finish a stage. If you beat a level with a time left of x11, x22, x33, x44, and so on, you get fireworks and the original Mario level completion song plays. Successfully complete the game, then load the completed saved game file to find a new blue Toad House at the beginning of World 1. Inside are four background patterns you can choose for the touchscreen. You can purchase these with Star Coins. The fifth and final pattern appears when you have collected all Golden Star Coins in all stages. To locate the secret exit in World 7-4, you need a mini-Mushroom (in storage, if possible). Make your way past the mid-level point and upward to the left side of the screen, high up. You eventually come to a flying "?" block. Use the mini-Mushroom to make Mario smaller and jump onto the block to stop it. Then, use the block to jump into the little opening in the brick wall. Make a "C" jump (backward C) and jump up and to the left to land at the top of the wall. Go over and you will see a small pipe that only mini-Mario can fit in. Take this pipe to reach the red flag secret exit. After you reach the mid-level point, you come to an area with two rows of bricks. You must be big but not mega-sized to perform this trick. Knock out the middle brick on the top row, then knock out the third brick in the bottom row to cause a vine to grow. Climb the vine and make your way to the end of the level above to reach the red flag secret exit. Go to the tower in World 1 with the Blue Shell power-up. Go to the first pipe that shoots you up into the air. On your way back down, go in the gold door. There are a lot of randomly moving platforms. On the right, there is a gap that always stays the same size. Go through it and you will see three blocks. Use the Blue Shell ability to break them all, and then break the last three. Go to the right and finish the level to unlock the World 1 Warp Cannon, which shoots you to World 5. In Secret Stage 2-A, there is a secret exit to the stage that grants access to the Warp Cannon in World 2. Near the end of the stage, there is one last spin-jump platform you use to reach the final Star Coin. Instead of stopping when you get the last Star Coin, continue falling to the right and press Jump at the same time you land on the red turtle on the final platform to get enough jump height to reach the platform with the pipe above you in the little alcove. Go through the pipe and exit the stage using the red flag. Enter the World 5 Ghost House and get a Mushroom from the blocks. Then, go up the stairs until you get to a place with three brick blocks on the left side of the screen. Stand on top of them and jump to reveal three invisible blocks. Next, wall jump on the left side to get on top of them. Stand on the middle raised block and duck, then jump to reveal a block with a vine in it. Climb up the vine and a Boxing Ghost appears. Jump off the vine to avoid taking damage from it. Kill it, climb back up, and enter the door. Kill the two Walking Pumpkins and stand in the middle. The platform wobbles, but as long as you stay in the center, you should be fine. When it reaches the top, exit and jump on the flagpole. A path opens to the Warp Cannon on the World Map. Enter and use the Cannon to get to World 8.